When we last left off, I was giving you positively miserable betting advice, essentially encouraging you to set your money on fire, with Jake Shields being Jake Shields and aways finding a way to win and undercard Brazilians stepping up with the biggest wins of their careers. And here we are again, confronted with an American wrassler taking on a Brazilian standout in a country that is not Amurrrica. Fortunately, for the money-minded, this one is a bit easier to suss out. Apropos of this card taking place in Manchester, it was originally intended to feature TUF 3 winner Michael Bisping in the headlining role against Mark Munoz. Bisping opened as a -175 favorite to Munoz's +145, the solid, smart sort of betting line that can encourage play on both sides. However, Bisping's eye injury nixed him from the bout just over a month ago. This is where a lesser person might write, "Now: Enter the Dragon," but I would never do you like that. Nonetheless, the main event replacement Lyoto Machida (-360) is a much different flavor from Bisping. For Munoz (+280), it might end up tasting like copper or iron -- whatever you think blood tastes like. A five-round fight would've given the heavy-hitting Munoz ample time to try to walk Bisping right into his winging power shots, the way fighters like Dan Henderson, Wanderlei Silva and Vitor Belfort have done in the past. Munoz's biggest issue when facing uppe- echelon fighters is that he remains susceptible to powerful strikes; by FightMetric count, he only absorbs 2.26 strikes per minute, but he has been dropped multiple times in his UFC tenure, both in knockout losses as well as fights he came back to win. Machida is tied for fourth all-time with 11 knockdowns in the Octagon, while landing 56% of his significant strikes, a truly elite MMA percentage. Now Munoz is faced with an opponent who won't just be circling on his bicycle, trying to touch him with combinations. The brains and brawn behind Reign MMA will now have to outright chase an elusive target, a man whose style over 25 minutes seems to suggest something gruesome might be headed Munoz's way. Machida has struggled with consistent, forward pressure in the past, but Munoz simply doesn't have a long-range kicking arsenal like Shogun Rua, Jon Jones or Phil Davis. Worse, Munoz does not have a strong, explosive outside shot; his NCAA national wrestling title and MMA grappling success come from his surprisingly nimble scrambling, strong workrate and fitness. Lyoto Machida does not want to -- nor will he -- roll around on the ground with Mark Munoz. Machida wants to move around and find his highlight-reel kick or diving left cross to get his middleweight career kick-started. Munoz hasn't gotten a lot of play since the opponent switch and understandably so. The Machida line won't get much better, so if you're feeling froggy, jump at your leisure. It's not a very enticing line but it is secure, making it a worthy addition to any three- or four-team parlay. Given the five-round schedule and how the fighters' striking styles intersect, Machida by knockout at +120 is the most stimulating prop offering. Although we got into dire straits previously by betting against local talent on their native soil, Manchester is the site of our financial redemption. While Ross Pearson (+120) might handle business against Melvin Guillard (-140) and offer some value, there are more UK fighters than not facing tricky opposition. 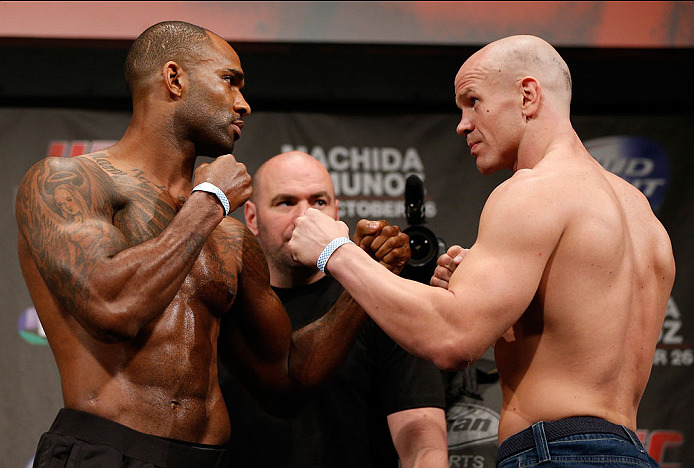 Heavy-hitting Brit Jimi Manuwa (-180) might be able to hurt Ryan Jimmo (+150), but his notoriously poor cardio and comparative lack of wrestling should actually see those odds reversed. Although he's showed a willingness to get into fisticuffs in the UFC, Jimmo is not above circling the outside and using his point-fighting background to rack up points, nor going into the clinch and tiring his foes out before taking them down from the body lock. These are still Jimmo's most tried-and-true MMA strategies and they don't portend success for Manuwa. Although folks got worried when Jimmo showed up to weigh-ins with a recently-stitched-up laceration on the back of his scalp, it's pretty damn unlikely to become a factor in the fight unless Manuwa is trying to get disqualified for rabbit punches, which actually helps our goal. Whether or not it ends up as "Fight of the Night" material, this is undoubtedly live dog and parlay material. Six-foot-six middleweight Luke Barnatt (+155), with his 77.5" reach, is an unwieldy opponent. However, Andrew Craig (-190) represents a considerable step up in competition for the Brit. On top of that, Craig is a robust middleweight with a 76" reach of his own and much better striking skills. Barnatt is very hittable and gives up a serious power advantage to the free-swinging Texan, on top of the fact Barnatt's best offense comes on the ground, where he will struggle to put away Craig. Bet 'em straight or pile 'em up. A Machida-Jimmo-Craig parlay pays +390, which is quite handsome thanks to Jimmo's generous odds. Feeling a little extra ballsy, you can tack on overweight-but-always-deadly John Lineker. Though Lineker (-370) clocked in over the flyweight limit for the third time in his UFC tenure, his actual fight performance should be aided by not having to cut the last few gruelling pounds as well as facing a largely one-dimensional grappler in Phil Harris (+300). That four-teamer is good for over a +520 payout, with three solid favorites and the most appealing underdog on the card (and not just for his dancing). But, if Jimmo and Co. do come through, don't be afraid to jump up and declare "It's Robot time!" to your fight-watching pals. They'll appreciate it -- or at least the round of drinks you'll have to buy them to atone for your sins of humiliation. This article is for informational and entertainment purposes only. Analyst Jordan Breen is an editor and radio host for Sherdog.com. Follow him on Twitter @jordanbreen.